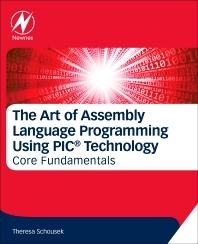 The Art of Assembly Language Programming Using PICmicro® Technology: Core Fundamentals thoroughly covers assembly language used in programming the PIC Microcontroller (MCU). Using the minimal instruction set characteristic of all PICmicro® products, the author elaborates on how to execute loops, control timing and disassemble code from C mnemonics. Detailed memory maps assist the reader with tricky areas of code, and appendices on basic math supplement reader background. In-depth coverage is further provided on paging techniques that are unique to PICmicro® 16C57. This book is written for a broad range of skill levels, and is relevant for both the beginner and skilled C-embedded programmer. In addition, a supplemental appendix provides advice on working with consultants, in general, and on selecting an appropriate consultant within the microchip design consultant program. With this book, users you will learn the symbols and terminology used by programmers and engineers in microprocessor applications, how to program using assembly language through examples and applications, how to program a microchip microprocessor, how to select the processor with minimal memory, and more. Dare we call it fun? Signed Integers – cover 2s compliment extensively, but mention 1s compliment and sign-magnitude, because these still come out of some sensors and FPGAs. Theresa Schousek has been a Microchip (R) Design Partner for 20 years as President, Chief Engineer, and Owner of Vital Innovations LLC. She began her work with computers in 1983 with a Commodore (R) 64. Prior to working as an independent design consultant, she worked for nearly 10 years in the automotive industry for General Motors Delphi Delco Electronics. She thrives on innovative design and has three process and sensor patented designs, plus one international patent. She is the sole inventor of General Motor's first infant seat and occupant detection system to inhibit airbag deployment. This system, and its derivatives, have 223 citations and is currently in production, 22 years later. Theresa earned a BSCEE from Purdue University, a dual accredited degree in Electrical Engineering and Computer Engineering. She earned a Master of Business Administration, with a practicum in operational process design, from University of Wisconsin, River Falls, in 2011.